For other uses, see Ayutthaya (disambiguation). Phra Nakhon Si Ayutthaya (Thai: พระนครศรีอยุธยา, pronounced [pʰráʔ ná(ʔ).kʰɔ̄ːn sǐː ʔā.jút.tʰā.jāː]; also spelled "Ayudhya"), or locally and simply Ayutthaya, is the former capital of Phra Nakhon Si Ayutthaya province in Thailand. Located in the valley of the Chao Phraya River. 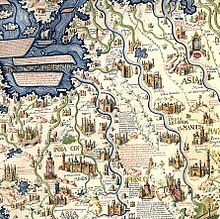 Ayutthaya is shown in the Fra Mauro map of the world (approximately 1450 CE) under the name "Scierno", derived from the Persian "Shahr-I-Naw", meaning "New City"
Ayutthaya is named after the city of Ayodhya in India, the birthplace of Rama in the Ramayana (Thai, Ramakien); phra (from Khmer: ព្រះ Preah) is a prefix for a noun concerning a royal person; nakhon designates an important or capital city (from Sanskrit: Nagar); the Thai honorific sri or si is from the Indian term of veneration Sri. Ayutthaya was founded in 1351[a] by King U Thong, who went there to escape a smallpox outbreak in Lop Buri and proclaimed it the capital of his kingdom, often referred to as the Ayutthaya kingdom or Siam. Ayutthaya became the second Siamese capital after Sukhothai. It is estimated that Ayutthaya by the year 1600 had a population of about 300,000, with the population perhaps reaching 1,000,000 around 1700, making it one of the world's largest cities at that time, when it was sometimes known as the "Venice of the East". In 1767, the city was destroyed by the Burmese army, resulting in the collapse of the kingdom. The ruins of the old city are preserved in the Ayutthaya historical park, which is recognised internationally as a UNESCO World Heritage Site. The ruins, characterised by the prang (reliquary towers) and gigantic monasteries, give an idea of the city's past splendour. Modern Ayutthaya was refounded a few kilometres to the east. 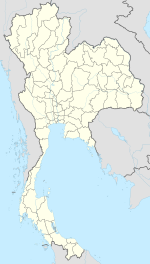 The city is about 40 miles (64 km) north of Bangkok. Chao Sam Phraya National Museum: The museum was specially display the objects excavated at Wat Racha Burana and Wat Maha That. The city is located at the junction of the Chao Phraya, Lopburi and Pa Sak rivers, and on the main north-south railway linking Chiang Mai to Bangkok. The old city is on an island formed by a bend of the Chao Phraya on the west and south sides, the Pa Sak on the east side and the Klong Muang canal on the northern side. The approximate centre of the old city is 14°20′N 100°34′E﻿ / ﻿14.333°N 100.567°E﻿ / 14.333; 100.567. Ayutthaya is accessible by air and rail. The closest airport is Bangkok’s Don Mueang International Airport, a hub for regional budget carriers. An elevated walkway connects Terminal 1 to the Don Muang Train Station, where can catch one of the Ayutthaya-bound trains that regularly roll through. Trains to Ayutthaya leave Bangkok's Hua Lamphong Station approximately every hour between 04:20 am. and 10:00 pm. The 3rd class fare is 15 bahts for the 1.5 hour trip. Train schedules are available from the information booth at Hua Lamphong Station, Bangkok. A Thailand-themed town named "Ayothaya" appears in the PC MMORPG Ragnarok Online. Ayutthaya is a stage in Soul Calibur II. The temples in Wat Phra Si Sanphet and Wat Ratchaburana from Ayutthaya appear in Street Fighter II, Kickboxer (as "Stone City"), Mortal Kombat, Mortal Kombat Annihilation, and throughout Mortal Kombat Conquest. The lying Buddha statue from the Ayutthaya ruins appears in Sagat's stage in most of the Street Fighter games. It was featured in the 2005 movie "The King Maker". The 1630 destruction of the Japanese quarter of Ayutthaya at the orders of Prasat Thong and its consequences is central to one of the stories in the 1632 series anthology Ring of Fire III, "All God's Children in the Burning East" by Garrett W. Vance. In the 2010 Nintendo DS game Golden Sun: Dark Dawn, the main characters visit the city of 'Ayuthay', which draws heavily on Thai culture and architecture. A Thailand-themed map named "Ayutthaya" appears in the game Overwatch (video game). a The city was founded on Friday, the 6th day of the waxing moon of the 5th month, 1893 Buddhist Era, corresponding to Friday, 4 March 1351 Common Era, according to the calculation of the Fine Arts Department of Thailand. ^ "Historic City of Ayutthaya - UNESCO World Heritage Centre". UNESCO World Heritage Centre. Retrieved 24 August 2012. ^ "Ayutthaya, Thailand's historic city". The Times Of India. 2008-07-31. ^ Derick Garnier (2004). Ayutthaya: Venice of the East. River books. ISBN 974-8225-60-7. ^ "Ayutthaya Historical Park". Asia's World Publishing Limited. Retrieved 2011-09-22. ^ "Historic City of Ayutthaya". UNESCO. Retrieved 2011-09-22. ^ Bellamy, Patrick. "The Hunt." Hambali: Mastermind of Terror. Crime Library. Retrieved on March 17, 2014. ^ "30 year Average (1961-1990) - AYUTTHAYA". Thai Meteorological Department. Retrieved 2011-11-12. ^ Mortal Kombat (Laser disc) Audio Commentary, UPC: 014381302165. ^ "The Buddha Statue". Fightingstreet.com. Retrieved 2011-12-18. ^ Rotchanaratha, Wina, ed. (1999). Prachum Phongsawadan Chabap Kanchanaphisek Lem Nueng ประชุมพงศาวดาร ฉบับกาญจนาภิเษก เล่ม ๑ [Golden Jubilee Collection of Historical Archives, Volume 1] (in Thai). Bangkok: Fine Arts Department of Thailand. p. 211. ISBN 9744192151. Stefan Halikowski Smith, Creolization and Diaspora in the Portuguese Indies: The Social World of Ayutthaya, 1640-1720 (Leiden, Brill, 2011) (European Expansion and Indigenous Response, 8). Wikimedia Commons has media related to Ayutthaya (city). Wikisource has the text of the 1911 Encyclopædia Britannica article Ayuthia. This page was last edited on 17 April 2019, at 15:20 (UTC).